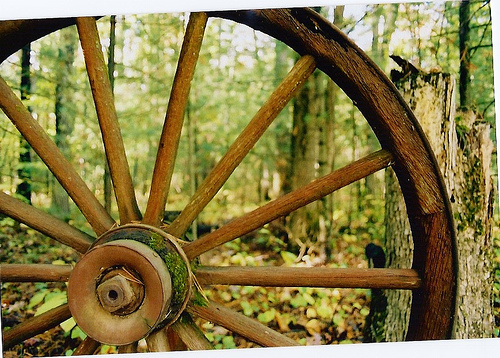 In the Middle Ages, Fortune’s Wheel was used as a way to depict the seemingly random ups and downs of life. When in dire straits, the suffering soul would wish for Fortune to turn her Wheel, and bring them back into good graces. The Wheel serves multiple functions, from representing the rise and fall of heroes and common folk, to being a reminder of the transience of all situations. Ultimately, your relationship to the Wheel is a function of where you place your center. If you attach to the rim, you will always be going down to the bottom or coming up to the top. Your life circumstance will be (perceived as) a constant oscillation between the opposites of lack and abundance, sickness and health, poverty and wealth. If, however, you choose to attach to the hub of the Wheel, you are in the same place at all times. From the center of the Wheel, you still experience the same events and life circumstances as you would on the rim, but your point of view is quite different. Instead of identifying with the unceasing turn of the Wheel, you identify with the certainty of the center. As the Wheel spins and carries you forward through the journey of Life, at the center you have the opportunity to express your true nature, one that acknowledges the crests and troughs, but is not dictated by them.